As we are on a mission to eat healthier we are incorporating more Quorn into our meals and making Monday's meat free is the perfect time to have some. This week we are going to have Quorn cottage pie. I love cottage pie as it is a great way to get some added vegetables into our diet. I love stir fries, they are quick, easy and full of healthy vegetables. I will be bulking it out with some noodles. We have tried the Slimming World sweet potato pasta bake in the past and really enjoyed it but this week I am giving it a twist by adding some tuna. Tray bakes are a great midweek meal. On Thursday I will be making one using Slimming World sausages. This is a recipe that I have got from Gino D'Acampo's Pronto book. I was delighted to find two of Gino's books under the Christmas tree. The original recipe is not Slimming World friendly but I am planning to make a few little changes that will make it lower in syns. As for the weekend, as usual, I am going to plan closer to the time. 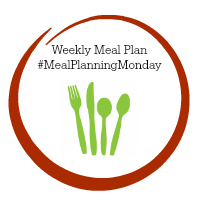 If you meal plan why not share your plan with the #MealPlanningMonday blog hop. If you do not blog you can join in by commenting with your meal plan. Hope you have a yummy week! My meal plan did not go great last week either but rather than not doing something, I made it and my girls hated it. Oopps. Hoping this week is better. Keep up the good work with the weigh ins. I am sure you will reach the goal you want. I thought I would have to go on a crash diet after Christmas but do you know what, I only put on a pound. So weird. I think my scales are broken. Haha.